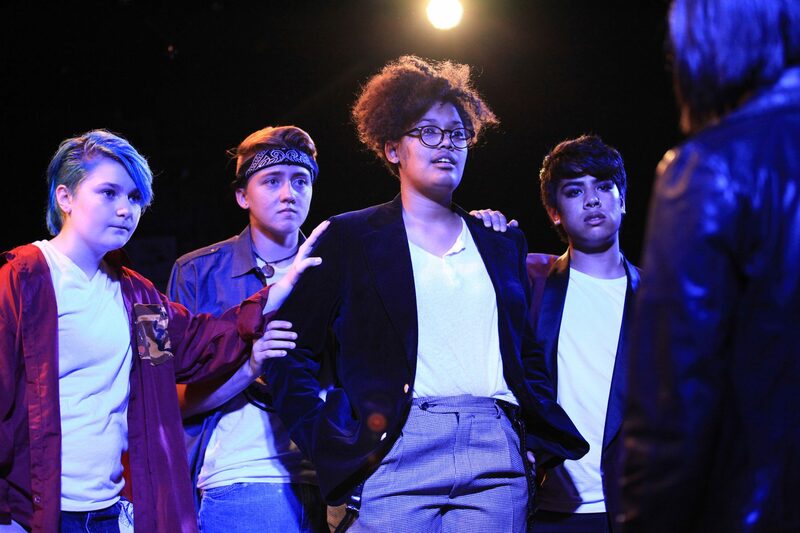 About Face Youth Theatre Ensemble’s Brave Like Them is an exciting and dynamic exploration of cultural movements and gender expression infused with feminist punk. The show is entirely devised and performed by the members of the About Face Youth Theatre Ensemble and co-directed by About Face’s Education and Outreach Director Ali Hoefnagel and Education Coordinator Kieran Kredell. The script was well-written, and memorable, especially impressive because the age range for the ensemble that devised it is 13-23 years old. The play takes place in the Riot Grrl movement of the 1990s, an underground punk feminist movement that originated Washington state, credited with being the beginning of third wave feminism. Famous bands that came out of that era include Bikini Kill, Bratmobile, and Sleater-Kinney. Brave Like Them takes us to Washington state in that era, and investigates both the successes of the movement but also the racial and class discrepancies – most of the voices of this movement were middle class, white cisgender women. The set (designed by Scott Penner) is papered with posters from iconic punk acts like Joan Jett, and the young people roam the space at the top of the show, cleverly setting our place and time. A couple of the ensemble members were talking to an audience member, and pretended to be mystified and confused by his cell phone flashlight, much to everyone’s amusement. Complete with twinkling bulb lights and alley seating, it’s hard not to feel like you’re at a real punk show when the actors break into their energetic opening dance highlighted by multicolored club lights (lighting by Kaili Story). Danni (Kyla Norton) and their best friend Jamie (Sandy Nguyen) are old friends reunited after Danni lived in racist Tacoma for six years. As they try to find their place in the punk movement, Danni wonders why more of their favorite punk bands don’t look like them. Danni’s old crush Sam (a charismatic and stylish Ophelia Ashley Murillo) conveniently comes waltzing back into Danni’s life, asking if they would like to hang out at a venue called The Crocodile. There, they meet femme superstar Hannah (Lilian McGrady) who chants her feminist manifesto “Girls to the front!” over a thrumming bass to an adoring crowd. Danni’s friend Jamie gets all up in this movement and finds her sense of self, immediately changing her aesthetic to match what a Riot Grrl is “supposed” to look like, complete with leather jacket, red lips and fishnets, Nguyen does a wonderful job portraying both Jamie’s bravado and her emotional complexity as she struggles balance her new Riot Grrl friends with Danni. The costume design by Jeanine Fry informs us where each character is in their lives and gender expressions effortlessly. Danni, still trying to find their identity, is in their school uniform for most of the play. While Jamie is off with the Riot Grrls, Danni meets some new friends in the form of an energetic ensemble that hangs out and plays punk music in the school gym. Noa (Jude Gordon), Coe (Jimbo Pestano) and Chris (Ben Flores), are all punk rockers who used to roll with Hannah until her movement got too exclusionary. We see this demonstrated very clearly when one of Hannah’s shows includes the words “no dudes no dykes no douchebags.” Coe uses they/them pronouns, Noa ze/sir, and Chris he/him. Chris points out that he is often excluded from feminist dialogue like Hannah’s because of his male presentation, but that erases the portion of his life where he was perceived as female, and his ability to talk about those injustices. Chris poses an interesting question: how can he possibly convince other people his masculinity isn’t a threat? It’s a really interesting argument that I’ve heard socially but was refreshing to see onstage, and Ben Flores’ thoughtful portrayal of this character really shines. The entire ensemble was strong, but there were many other notable performances, including the hilariously spacey record store clerk (Sharon Pasia), who encourages Danni to be a part of the movement, and not a part of the crowd. Danni’s mother, played by Mia Vivens, gives an endearing performance as a mother who has to navigate a new relationship with her child. Fresh from a divorce and struggling financially, she is often anxious and sometimes angry (but only, as she rightfully points out, because she’s black and had to sell her business and live in Tacoma at her husband’s behest for six years – I feel you sis), but never gives up on loving her family fiercely. Brave Like Them is about the power of friendship, the discovery of personal identity, and the multifaceted aspects a movement needs to have so that it can succeed. It examines our fear of breaking apart systems and movements when we have nothing to replace them with, even if the movement is imperfect. A movement needs to encompass all people, or it inevitably dies. However, Brave Like Them does not condemn these movements, but examines how even when they are fleeting, even when we find ourselves in opposition to them, they can help us find the most important parts of ourselves. Photo Credit: (left to right) Jude Gordon, Ben Flores, Kyla Norton and Jimbo Pestano in About Face Youth Ensemble Theatre’s world premiere of Brave Like Them, co-directed by Ali Hoefnagel and Kieran Kredell. Photo by Emily Schwartz. BIAS ALERT: I directed for the About Face Out Front 2017 Series, and identify as genderqueer.